Most people don’t question what makes them pick a certain product off the shelf, or even what draws them to buy a blue and pink coffee drink for $4.45, but food marketing major Jessica Olszyk ’19 was so interested in this process that she dedicated her summer to it. Olszyk decided her topic, consumer psychology within the food industry, based on the research of her faculty mentor, Ernest Baskin, Ph.D, an assistant professor of food marketing who is an expert in consumer judgment and decision making, particularly consumer biases. One part Baskin’s research to which Olszyk contributed included a survey conducted with SJU students and family members. The goal was to analyze purchasing habits when choosing for oneself versus choosing for others. The participants had the choice between one higher quality mint and two lower quality mints; the control group choosing for themselves and the experimental group choosing for a friend. 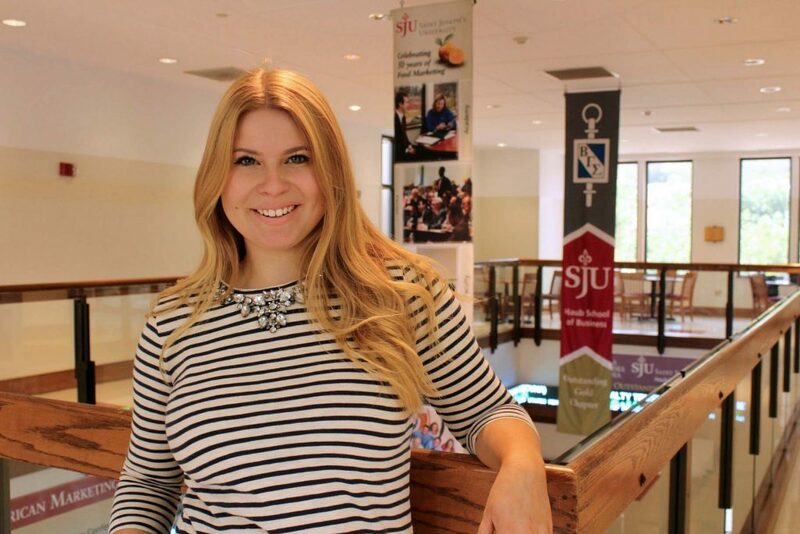 “It was interesting to note how those in the experiment made the decision for themselves; how they weighed quality vs. quantity, how they rationalized [their choice],” says Olszyk, who has maintained Dean’s List honors since coming to SJU. She is still analyzing the results of the experiment; however, previous research suggests that individuals choosing for themselves would select a higher quantity based on monetary concerns, while those choosing for a friend would select the higher quality due to social pressure. The experiment led her, under Baskin’s guidance, to write case studies, or lesson plans, about trends in food marketing through SAGE publication, which creates lesson plans that universities can use. Her most recent topic was the Unicorn Frappuccino, released by Starbucks in early May this year. Her case studies center around flashy products in the market that dramatically generate consumer interest. “My goal is to have some of my work used in the classroom to help professors effectively teach about the industry,” Olszyk says. Outside of the classroom, she is a distinguished member of Villiger Speech and Debate Society and Dean’s Leadership Program, an RA, and a sister of Alpha Gamma Delta.